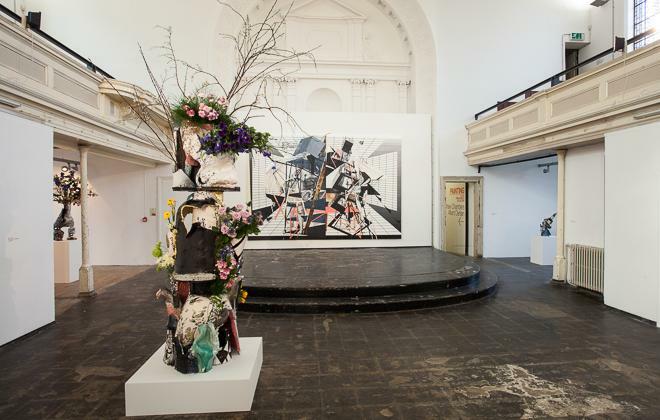 I conducted this interview with the talented Francesca DiMattio as she was finishing the installation of her exhibition titled ‘Vertical Arrangements’ at the Zabludowicz Collection in London where she was exhibiting new ceramic sculptures beside her paintings. This was a group show at the gallery including work by Albert Oehlen and Matthew Chambers . A resident of New York and represented by Pippy Houldsworth Gallery in London and Salon 94 in New York, Francesca is a graduate of Cooper Union and Columbia University. Francesca DiMattio has been A resident of New York and represented by Pippy Houldsworth Gallery in London and Salon 94 in New York, Francesca is a graduate of The Cooper Union and Columbia University. JW: Why have you placed flowers in the ceramic sculpture, Totem? FD: It’s really a sculpture inspired by vase structure, form and histories. To house the flowers makes a lot of sense but without flowers totally works too. All of these ceramic pieces in the show have the ability to be candlesticks and candelabra too in different configurations. ‘Totem’ is really heavy and takes five guys to lift. It’s made of three pieces, which are lifted onto each other for the exhibition. Clay is weird. These are hand-built slabs an inch and a half thick. It involved lots of different techniques being used to produce these effects. FM: Some of this is just piling on the glaze in the ceramic sculptures, as if in the process of learning. It’s harder rendering effects this way. Technically being out of control is actually hard to achieve. The quantities are shocking. The sculptures appear haphazard as if a student had made them but it takes a lot of piling on and I mixed all the crackling glaze myself. You still have to have know the direction you’re taking. JW: For all its mashed together and jagged appearance, there’s a completion in ‘Totem’ that feels whole. FD No, I really don’t think it is necessary but I’m happy to do it. It can be interesting, but the work stands on its own. FD: I will be working for a show at the Blaffer Museum in Houston opening next winter, so I want to make paintings and sculpture using new materials like acqua resin. I will aim to produce greater height in the ceramic sculptures without the weight and fragility because clay can make them super-heavy. There’s no way to fire them in New York and they are very expensive to make. That’s one of the reasons I went out to Arizona to use a special kiln. I need to work in sections. From working with ceramic glazing, the surfaces of my paintings are becoming more articulated. There’s a lot more variety. Having used cake decorating extruder tips for the ceramics, I’m now using them to make paintings. Previous PostRichard Wright’s ceiling murals at The Rijksmuseum, AmsterdamNext PostWest End Sculpture: Marcel Duchamp, Sterling Ruby and Alexander Calder.